The Autumn Jubilee Sew Along begins today with a fun project that will be immediately useful this season. We’ll be making placemats for the holidays, perfect for the Thanksgiving table or your kitchen table for everyday use all autumn. This sew along will cover a 5 week period, with three posts publishing every other Friday until November 1. The actual pattern for these placemats is part of Fat Quarter Shop’s Blog Remix event, revisiting old patterns with new ideas. So today, we’ll begin with the center, which is a 12-inch block. I made my placemats with Maple Leaves, but you can choose any 12-inch block you like. So, decide what you’d like to have as the center, and how many placemats you want to make. Grab some additional coordinating fabrics, as we will use those next time for the side bits and backing. 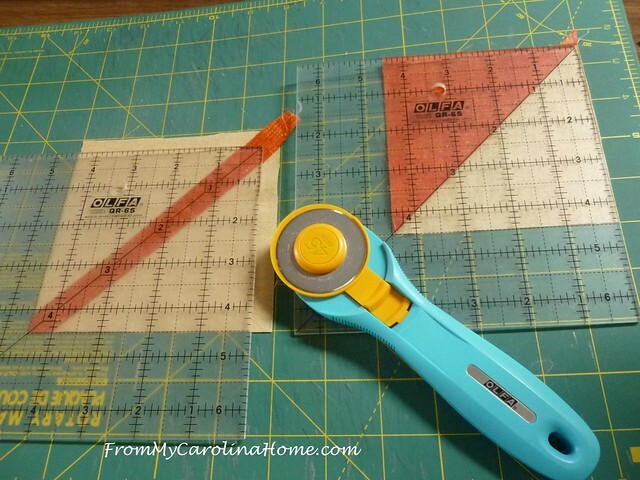 On two of the background 5-inch squares, draw sewing lines 1/4-inch away from the center on the diagonal. On the third square, cut in half on the diagonal to make two triangles. 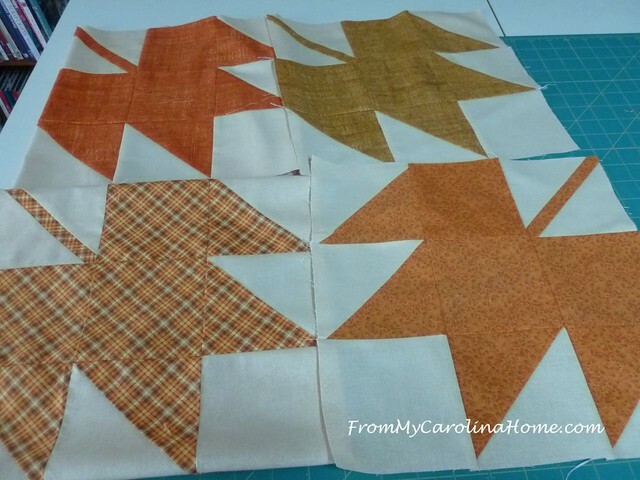 Pair up the 5-inch maple leaf color squares with the background ones, and sew on the lines. Chain sew for efficiency. 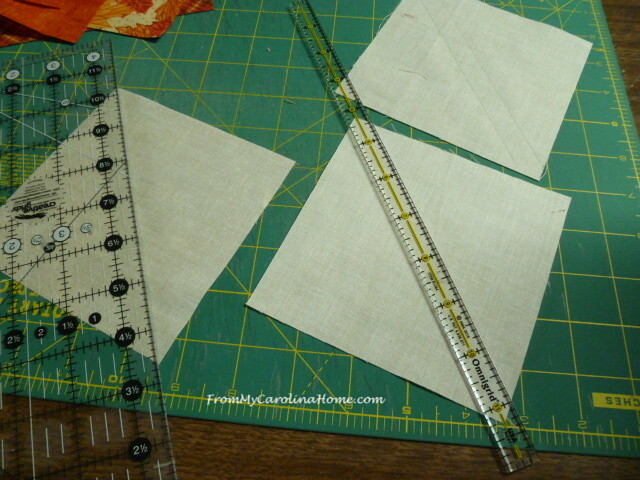 Use square cut into two triangles with the 7-inch strip to create the stem. Square all units to 4-1/2-inches. 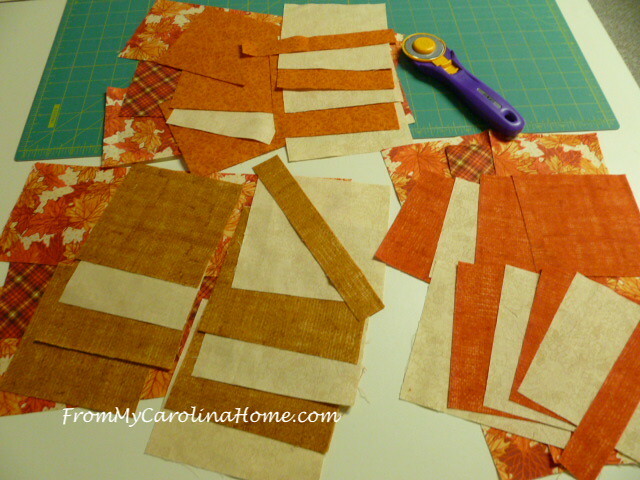 Lay out the leaf block and sew in rows, pressing seams in alternate directions. Again, any 12-inch block will suffice, these pumpkins from our Autumn Jubilee Quilt Along that just started on Monday would do well too! Oh, and just so you know, the leaf is NOT Block B for the quilt along, LOL!! Welcome to my new readers, click on the link if you missed the first quilt along post, which is a different project from the Teacups Quilt Along. In two weeks, we’ll take the 12-1/2-inch blocks and add some details to finish the placemat tops, then the last post we’ll finish them up and see some other ideas for this pattern. So, make the number of blocks you’ll need for your Thanksgiving table during the next two weeks. Today’s Giveaway is a Dream Orient Queen size batting from Quilter’s Dream! This is a lightweight bamboo blend batt that is wonderful for lightweight quilts and wall hangings. To enter, leave a comment on this post then click on the button below to enter with the Rafflecopter widget. What would you quilt with Dream Orient? Find Dream Orient at Fat Quarter Shop. Just in case you missed it, Jolly Jabber, the FQS blog, is sponsoring a Mega Quilt Market Sweepstakes! See the Jolly Jabber blog to enter, deadline is October 26th!! Today is the last day to watch free videos on Craftsy’s new Blueprint Unlimited site on card making and quilting, plus cooking and knitting and gardening, more than 20 categories!! I am giving serious consideration to the special ending today of one year of unlimited watching for $100, that is just $8.33 a month – just watch one class a month and it has more than paid for itself! October 5th through 12th, Blueprint is unlocking thousands of expert-led creative classes, plus projects, recipes, patterns and more to help you expand your creativity. Just yesterday I watched a wonderful class by Elizabeth Andoh on Japanese cooking techniques, someone I just saw on Milk Street last weekend! Everything’s FREE during their Get Started Event, last day! I have heard that bamboo batting helps the quilt layers stick together. I like that, less basting! I will make a beautiful quilt, I made a throw last year with Dream Orient, and really like it. I would use it in one of my quilts! I have a couple of WIPs to finish & the Teacups quilt will be my next attempt! Wonderful giveaway! Have not even heard of this type of batting. Curious about it! Love the maple leaf block. As I am a Canadian we have just celebrated Thanksgiving and I have my maple leaf quilt out on display. Love the warmth and coziness of fall coloured quilts in the home. I would use the Dream Orient batting in a bed size quilt. I usually use bamboo batting and it would be interesting to see how it differs. Love the pumpkin quilt along. I would use it in the charity quilt I am making for the Children’s home in Ocala Fl. Each of the blocks is a different colour so I hope the child who gets it likes it. Dream Cotton Request is my favorite of all batting. But I would like to try the bamboo Orient next time i need a bat. Enjoy your articles and appreciate your love for autumn–one of my favorite seasons–along with winter, spring and summer!!! I would love to try it in a lap quilt. Thanks for the chance to win. I love those placemat blocks! Thank you for the ‘Dreamy’ batting giveaway. It’s my favorite brand! I am looking forward to making the placemats. I have never used the Quilter’s Dream Orient. I need to try it. Thanks for hosting the giveaway. Maple Leaf — one of my favorite blocks. I have two large quilt tops that need to be completed. A Queen size batting would be perfect for one of them, and the quilt would grace our guest bed. I would use it to quilt a baby quilt that I have ready. Looks like great fun for the fall. I would love to try bamboo batting for a summer quilt! Quilter’s Dream website. They have so many types of batting and I would probably like to try the 80/20, since I am still working on a full bolt of another brand of batting. Our weather went from 83 degrees on Wednesday to 31 degrees this morning. Way too big a difference for these old bones. That batting is one I’d love to try. I have a quilt top all ready to go onto the hand quilting frame right after the holidays. That is where I’d use the batting should I be lucky enough to win. 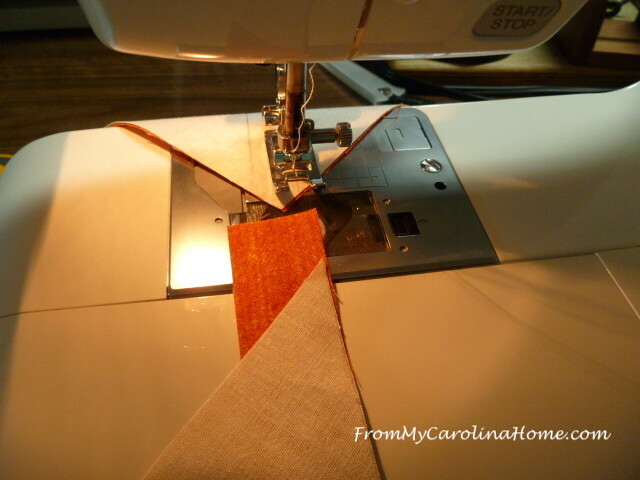 being a new quilter I am having so much fun quilting all different quilts. my “to make” list keeps getting bigger. I find all sorts of pretty quilts that I would like to make. I know that I would be able to put this batting to good use and a good home. I’ve got several quilts in my “need to be quilted” box that I would love to try the bamboo batting with. I’ve never used it before, but have heard good things about it. Plan to make some of your pumpkin blocks before the day is over. 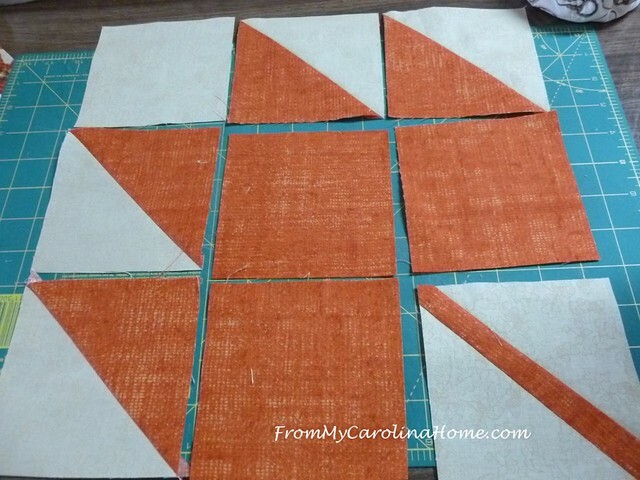 Would love to try the bamboo batting on this lap quilt project. I would quilt my grandson’s new big boy bed quilt! It is a twin size with his favorite airplanes all over it. I have heard that the bamboo batting is a dream to work with. I’m working on a quilt at the moment (Country Garden ) and would like to try out bamboo batting to see for myself if it is as good as I here. It might change the way I have been quilting. I’m always needing batting for a new project – it would be fun to try something new! I’ve made a couple of the 12 inch pumpkins you gave directions for in your Monday post. They could make fun placemats! Working on a Quilt of Valor and this batting would be perfect! I love the pumpkin block. Maple leaves are one of my favorite blocks. The leaves look so pretty and fallish. The pumpkins are great too – especially that fun white one. I would love to try the Dream Orient batting in a quilt for our bed, still don’t have a quilt for us! Thank you for this sew along and opportunity to win some high quality batting. Another fun block and project to make! I’d love to try that Bamboo batting. I have used a lot of other batts from Quilter’s Dream. The Dream Angel was particularly nice in some children’s quilts. With Dream Orient, I would sew a quilt. I have not used it yet, but it sounds luscious! Thank you. I have heard how dreamy this batting is but have not had the opportunity to get some… if I were the lucky winner, I’d use it to make my daughter a quilt. I’ve got more than one finished top to try out this dreamy batting. Have never used this batting. It sounds lovely I have a quilt top that is waiting for a special batting for a special quilt for my mom for her 70th birthday. Thanks for hosting this lovely event every year. I have a Christmas quilt ready to go to the longarmers. This would work well for it. i have a lovely soft batik that would be perfect for this batting. I think the batting would be perfect for alap quilt for a friend who spends a lot of time connected to medical equipment. I have a hunters star quilt that needs to be quilted. I love your white pumpkin block! So pretty in today’s home. I have tried another brand of batting with bamboo and it was great! Anything from Quilter’s Dream is a real treasure to use. I love them all! Great!—-Placemats! 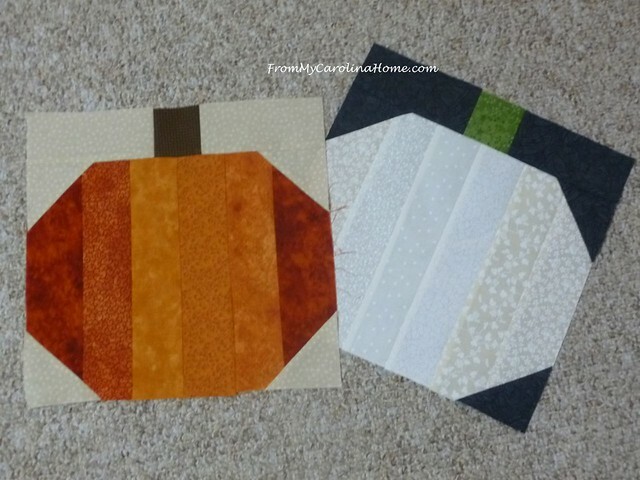 I made some extra pumpkin blocks, thinking I would make some placemats to go with the table-topper sized quilt, but Maple leaves would be so pretty too, and I would be able to use them for Thanksgiving! No large quilt on the horizon these days, but I never know what great project will some along to use the lovely batting! Thank you for this great post. I love the leaves. I would love to use the batting on a charity quilt. I make a lot of them. I would love to try this batting–I’m still learning about the different types of batting available! Would try it on my next quilt project. I would use it to make a new summer weight quilt for my new bed in my new house. Hello Carole, I would use it to quilt the Christmas Quilt we made on your blog…which year was it? I honestly think it is a gorgeous Christmas Quilt and without you and designing the pattern we used, it would have never have happened. Yes, even being that it is my favorite quilt, I have not put borders on it or anything. I am hoping to finish it this year. Thanks for all of these great new fabulous quilt patterns and projects! Autumn Jubilee is always a magnificent event on your blog!! Have a great day! I would love to try this batting. I am getting ready to start quilting a Dream Big panel so I would love to use the batting for the panel. Thanks for a chance to win. I am working on a mystery quilt with my guild that will be done soon and I will need to quilt it. Would love to try the batting. I have never tried bamboo batting before. I have several small quilts just waiting for batting ! Great project, I would love to try this batting! This batting sounds wonderful! I’d use it in a quilt. What a nice gift. I would use it to finish the UFO quilt tops that I have been working on all year. Bamboo batting is supposedly very warm and easy to quilt. I’d love to try it; got fingers crossed to win this item. Love your postings, Carole, so informative and interesting. Thanks for what you do! I’ve been wanting to try bamboo batting, I’ve heard wonderful things about it. I have two large throws I’m finishing up on and would love to use it in one of those! I have a lot of Christmas wall hangings cut out and ready to sew. I would use this bamboo batting for them. Thanks! I would love to use this batting in the quilt which I bought while my husband and I visited Alaska this summer. Alaskan Flowers. Enjoy your blog. I would love to use this batting for a baby quilt I am making. Thanks for sharing your creativity and your generous spirit with us! I wonder how this batting “holds up” over time. I would love to give it a try! Cute project!! i have never tried bamboo batting. i’d love to use it on a couple of my tops waiting to be finished! 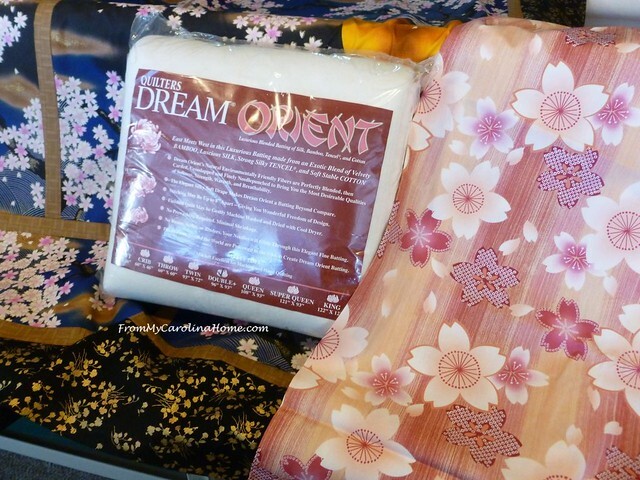 I have not quilted with Dream Orient, it would be fun to try. Thank you for hosting this special series every year, Carole! I really enjoy it. Thank you! I think I have as much fun as readers do, but I have to stay ahead of you all, LOL!! My studio is a mess!! Oh, and I would probably make placemats. i was positive that this is the second block of the quilt until you said no, i guess i’ll just have to make some of these also!!!!! I have an oriental style quilt I’d use this for. These blocks look perfect for table mats. Lots of decorating happening! I would love to try the Bamboo batting. I love this time of the year and am anxious to make something pretty! I’ve never used this batting before, but would love to try it. I would use the bamboo batting in my Herfordshire quilt to make it lighter since it is an English paper piecing quilt and be heavier quilt top. Fall inspirations turn into lovely quilted projects. Dream Orient would be great for a new quilt on my bed. I would use it for a quilt or a table cloth. I like that Dream Orient has natural environmentally friendly fibers. I have never tried a bamboo batting but would love to try this product. I’d quilt a lap quilt with this batting! I have never used Dream Orient. I make lap quilts for a nursing home. Most are scrappy. I would use the batting for them. A WALL HANGING! Have not tried the Orient yet!THANKS FOR SHARING! I would like to use this batting for an autumn table runner. Oh my gosh what a beautiful table runner and how simple! I have a few WIP and would use it for that a art quilt in particular of my Pomerian from Susan Carlson’s class. Thanks for the opportunity! I have a baby quilt which needs batting so i would start with that. I am making a baby quilt for new grandma gift. Would love to try Quilter’s Dream. I live in a warm, humid climate and a lighter weight batting and quilt is all that works here. I would use Dream Orient for my quilt because it meets that criteria. I’ve never used Dream Orient but your brand is my absolute preferred favorite! I’d like to use Dream Orient in a Cuddle (minky) fabric quilt. I purchased one of those stands to display the small 10×12 seasonal quilt ‘pictures. Quilter’s Dream Orient would be perfect batting for using in those. My favorites are Wool and Orient!! !